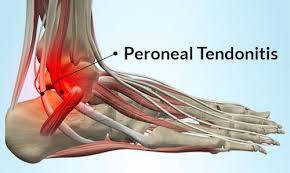 The peroneal tendons are two strong tendons that connect the muscles on the outside of the leg to the bones in the foot. They run behind the bone in the ankle called the fibula. When they contract they move the foot down and out. They play an important role in stabilizing the foot on uneven surfaces. When the foot turns excessively in (i.e. an attempt at ankle sprain) these tendons contract and stabilizes the ankle so that it does not twist too far in. Tendons are covered by a ligament called the peroneal retinaculum. It is a strong ligament that connects the outer leg bone (fibula) to the heel (calcaneus). 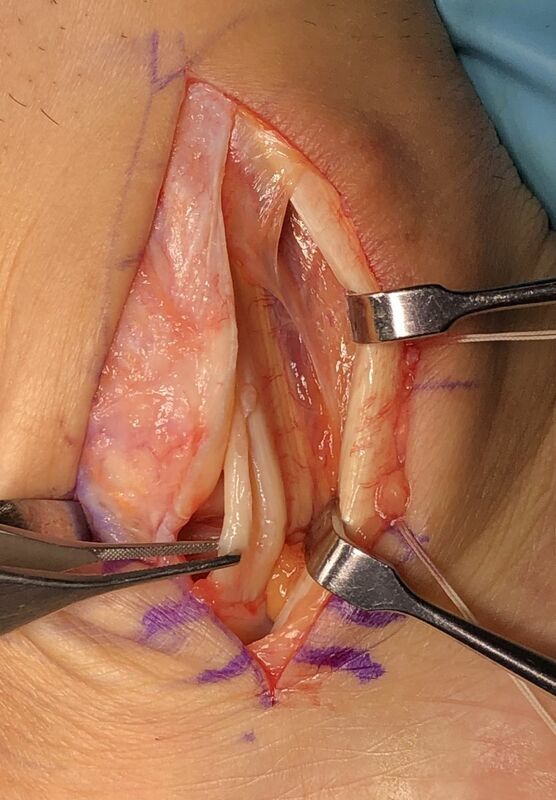 The ligament covers the peroneal tendons and helps keep them in a groove behind the fibula. Under normal circumstances, it helps to allow the tendons to contract with extremely high forces without dislocating. Without this ligament restraint, the muscle-tendon unit cannot generate enough force during an activity. 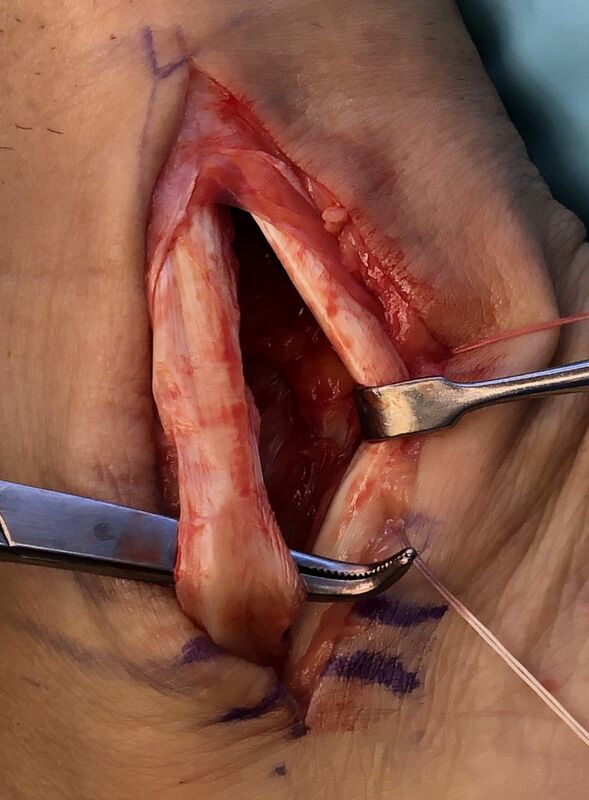 If the tendons dislocate, they do not have a normal mechanical advantage and they become weak and painful and tears often develop in the tendon. The weak or loose ligament that covers the tendons can allow the tendons to dislocate. 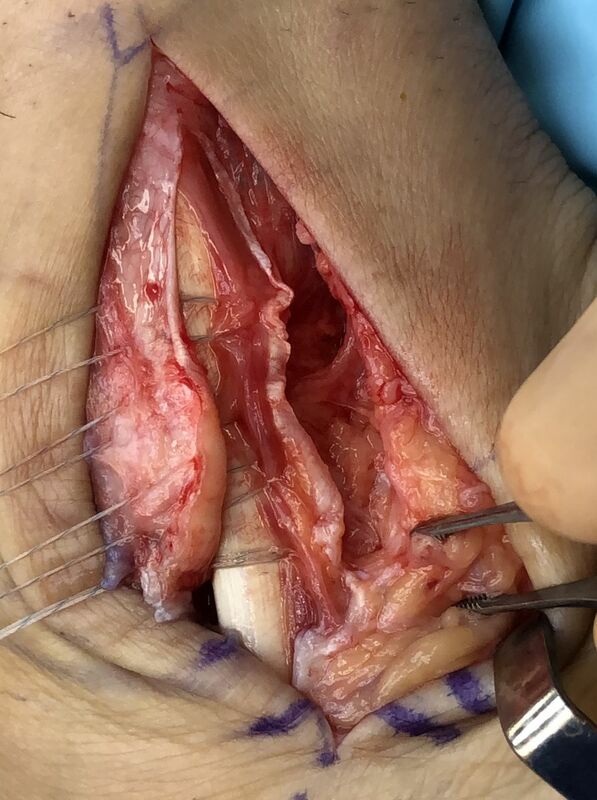 A shallow groove in the fibula may not allow the tendons to seat properly. Twisting injury to the ankle that causes the tendons to over contract and tears the ligament that covers it. Twisting injury to the ankle may cause a severe contraction causing a fracture off of the fibula, allowing the tendons to dislocate. Anomalous muscle in the outer part of the ankle. Hypertrophy of a normal muscle causing too much bulk on the outside of the ankle. Swelling behind the fibula on the outside of the ankle. Popping sensation with the movement of the foot down and in and up and out. 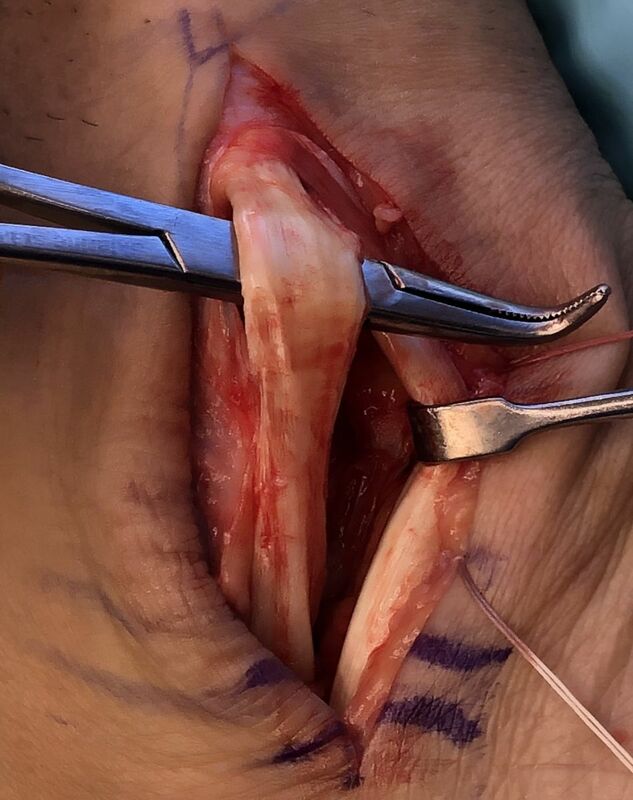 The appearance of the tendons in the front part of the ankle instead of in their normal position behind the fibula where they are not visible. Often associated with a tear of the peroneus brevis tendon. May be associated with ankle ligament injury and chronic instability of the ligaments in the ankle. X-rays are usually taken to see if any bone injury has occurred in conjunction with the ligament tear. MRIs are necessary to evaluate not only the injury to the ligament but also the tendon to identify any split tears. CT scans may be necessary to evaluate the depth of the groove in the fibula. When shallow, flat or convex it may be necessary to repair this at the same time. If an acute injury is seen early, immediate application of a cast will possibly allow the ligament to heal while keeping the tendons in their proper place behind the fibula. If unresponsive to casting, surgical repair of the ligament is necessary. If a shallow groove in the bone is seen it may be deepened to allow the tendon to sit in a better position without recurring subluxation. If a tendon is also torn it is repaired at the same time as the ligament that holds it in place. 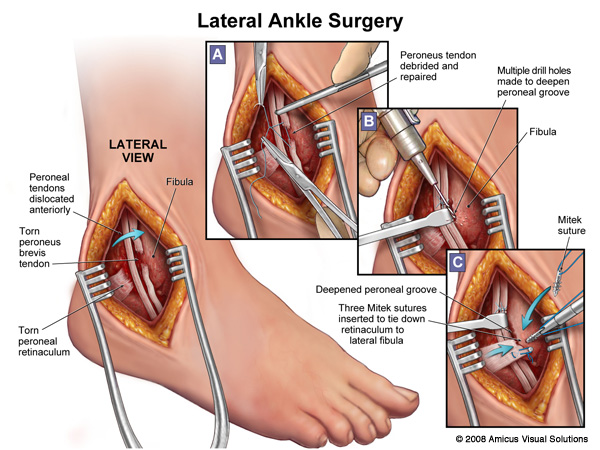 If chronic instability of the ligaments in the front of the ankle is seen at the same time they are also repaired to allow more normal ankle function and a full return to activity. 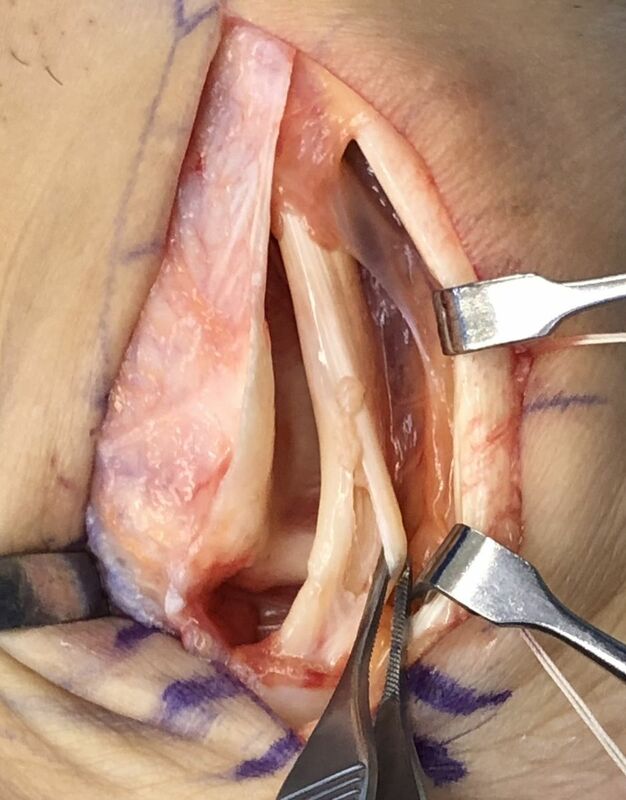 Any anatomical variant is addressed at the time of surgery, including removal of any anomalous muscle that may be contributing to the recurrent subluxation. Excellent in a recreational or professional athlete allowing future participation at the preinjury level.